The glorious effort put by eight division world champion Manny “Pacman” Pacquiao to defeat Mexican-American boxer Brandon Rios didn’t go unnoticed here and abroad as stars and known personalities from different fields lauded him on social media. After two losses, the People’s Champ made a notable boxing comeback by besting Rios via unanimous decision on Sunday, November 24 at a fight in Cotai Arena in Macau. While Pacquiao’s coach Freddie Roach thought that it’s Pacquiao’s compassion that got in the way of him knocking out Rios, host Tim Yap thought otherwise. “Compassion is what makes @MannyPacquiao a champion. He could have gone for that KO but he didn't. Restraint gets the victory. 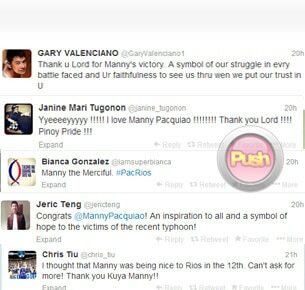 #PacmanRios” Yap said on Twitter. While former UST Captain Ball Jeric Teng praised him for being an inspiration. “Congrats @MannyPacquiao! An inspiration to all and a symbol of hope to the victims of the recent typhoon,” said he. Singer-rapper Jose Villanueva, better known as Quest thanked the pound-for-pound champ that he “Give honor to whom honor is due” as he dedicated his win for the typhoon victims in Visayas. TV host-writer Franco Mabanta, thought that despite the typhoon, everything happened at a perfect timing, including Pacquiao’s win. “Typhoon hits, world sees Filipino spirit, world sees Pacquiao dominate. Fantastic timing. Good for you, Manny. #PinoyPride #TenForManny,” said Mabanta. While some were celebratory after Pacquiao’s win, some took his win lightly by cracking jokes like singer-composer Jim Paredes who wrote on his Twitter account, “Tapos na ang Sometimes when we touch Manny, please sing Eye of the Tiger or We are the Champions” in reference to the boxing champ’s much-replicated rendition of Dan Hill’s hit. The other Kapamilya stars who congratulated him on Twitter were Meg Imperial, Pokwang, Bangs Garcia, Sunshine Cruz, Slater Young, Iza Calzado, Khalil Ramos, MJ Felipe, Young JV, Nikki Valdez, Juris Fernandez, Jane Oineza, Carla Humphries, Helga Krapf, Jhong Hilario, Denise Laurel, Atom Araullo, Manila vice mayor Isko Moreno and director Lino Cayetano. Rachelle Ann Go, Marvin Agustin, Mo Twister, Ogie Alcasid, Christian Bautista, Paloma Esmeria, Derek Ramsay, Isabel Oli, Kris Lawrence, Cristalle Belo, and fashion designer Rajo Laurel also had nothing but good words about Pacquiao’s win. It may be recalled that Pacquiao had showcased his singing skills on Kimmel’s show a couple of times by singing hits like Imagine, Sometimes When We Touch, and How Deep is Your Love. Meanwhile, those who were in Macau who had the rare chance of witnessing the match live, like American Idol alum and Filipino-American Jessica Sanchez, who had the honor of singing both the Philippine and American national anthem during the PacRios bout, still wasn’t able to contain her joy over Pacquiao’s win. “So proud of @MannyPacquiao !!! Thank you for this special day!!! See you in General Santos City next week! pic.twitter.com/Tbd0Tp68J5” she wrote. Aside from Sanchez and Hilton, also spotted watching along the ringside during the fight are English footballer David Beckham and Pacquiao’s former opponent Miguel Cotto. Certain local personalities also flew to Macau to watch the match live. Among them were the Gutierrez family composed of Ruffa Gutierrez, Eddie Gutierrez, Annabelle Rama, and Richard Gutierrez’s beau Sarah Lahbati as well as Philippine Azkals striker Phil Younghusband, Cesar Montano, apl.de.ap, Dingdong Dantes and Manila Mayor Joseph “Erap” Estrada.